Meralco and the Department of Energy (DOE) join hands to educate customers on the cost of operating their appliances. Dubbed as the Meralco “Orange Tag,” the campaign shows consumers how much the most commonly used appliances at home cost a household per hour or per day. Meralco’s Orange Tag complements the ongoing Yellow Tag effort of DOE, which shows customers the energy efficiency rating of appliances. The Orange Tag initiative is part of Meralco’s continuous effort to educate its customers on energy efficiency to empower them and help them make more informed choices. 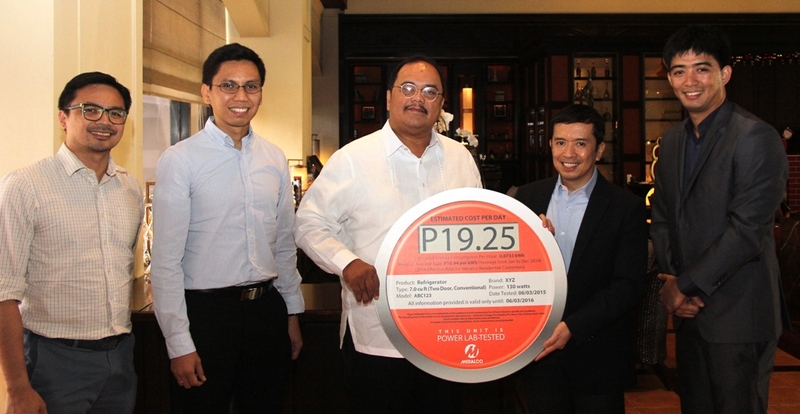 Shown from left to right are: Meralco Senior Corporate Communications Associate Michael D. Garcia, Meralco Regulatory Liaison Officer Mark Anthony T. Delumen, DOE Undersecretary Donato D. Marcos, Meralco Vice President and Head of Marketing and Customer Solutions and Product Development Jose Antonio T. Valdez, and Meralco Customer Solutions Associate Miguel Antonino L. Varela.